Let me just start by stating I love this book! 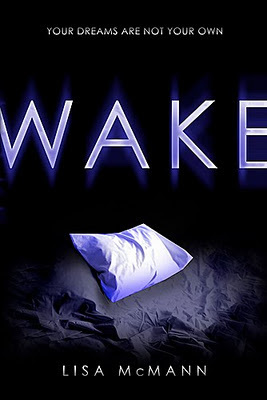 Wake is a perfect example of a excellent paranormal romance novel. Seventeen year old Janie has a secret, she visits people in their dreams. She doesn't want to, it just happens. One minute she is sitting in class or at work and the next thing she knows, she is following someone into the forest. It's annoying but she can't help it. She has no control over it. Things get complicated when she befriends the school loner, Cabel. She is surprised to learn that some of his dreams are about her and through these dreams they learn about each others secrets. Wake is an intriguing book, it just sucked me in from the get go. Even though the story is nothing like it, but the book reminded me of the movie The Butterfly Effect. Maybe because of the writing style, which I must add was so different and kind of brilliant. I enjoyed the book thoroughly. The characters were well defined, the mystery was top notch and it was very romantic. I loved Janie and Cabel as indivisual characters and as a couple. I loved this book and can't wait to read the rest of the trilogy. The story is very powerful, moving and different from all the PNR novels out there. Very interesting characters. They were very well define, even though the book is so tight and compact. The romance between Janie and Cabel was amazing. It was intense, cute and emotional. I adored the character of Janie, she was strong and very realistic. The writing takes some getting use to, but I loved it nonetheless. The book was extremely short, i mean just 210 pages. I so wanted to read more! I agree with you, this is a great series! Thanks for your review. I have wanted to read this series for so long but still haven't gotten around to it! I will have to check it out soon by the sounds! Great review!